Just joined .. I found this entry for my great-grandfather and great-grandmother .. have been able to figure out their ages, their parents names (and in the case of my great-grandmother that she was illegitimate) ... what I can't figure out is all the entries afterwards .. hope someone can help. Thank you. The long entry at the end of the record is just legal housekeeping which spells out that all the legalities which were required for a valid and licit Roman Catholic marriage had been fulfilled. 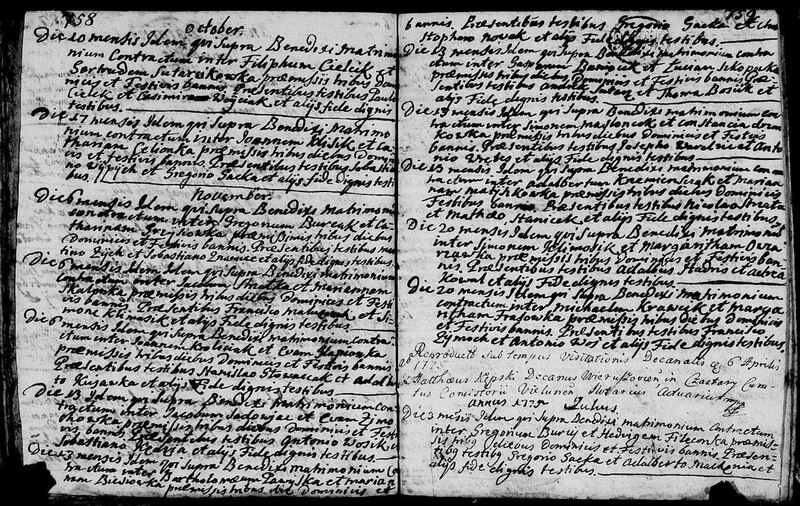 It is typical of what is usually found in marriage records from the Austrian Partition (Galicia) during the 19th Century. Given names are translated into their Polish form. The name of the mother of the bride is spelled “Maryanna”, which was the spelling in use in the 19th Century. The contemporary Polish spelling is “Marianna”. The columnar headings may or may not be exactly what is found in your record. (There were several modifications made during the 19th Century.) However, they appear to be a good fit. Final entry: The 3 banns were announced beforehand in the parish church of the bride on the 3rd, 4th, and 5th Sundays after Easter, that is on the 7th, 14th, (&) 25th days of May. The same in the parish of the groom on the 4th (&) 5th Sundays after Easter and on the Feast of the Ascension of Our Lord, that is on the 14th, 21st, (&) 25th days of May. Permission was obtained from the orphans (& minors) court* for the underage bride granted at Przeworsk on June 8, 1876 Number 4204. 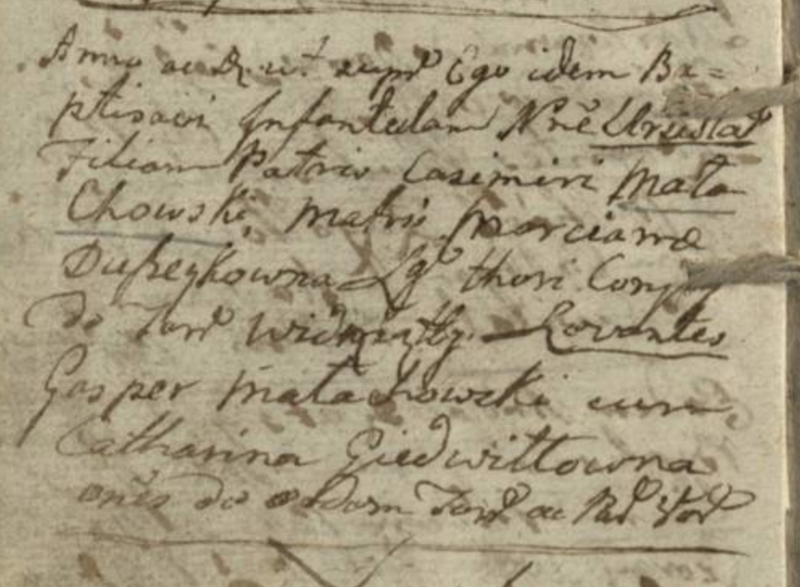 The father’s consent was granted for the underage** groom: “As the father, Szymon Puć, I grant permission to my son, Józef, to enter the bonds of matrimony with Anna Liszka and in witness to which in the presence of the witnesses I sign with my mark” (mark of Szymon) +Szymon Puć, the father of Józef Puć. The witnesses as above. No impediment was discovered. Wojciech Lebracki(? ), the assistant priest of this place, blessed the newlyweds. instancia pupillaris/orphans (& minors) court was an institution of the Austrian government which delt with minors and orphans in Przeworsk would have been where the court for the area was located. **underage groom: Although he was 23 he was living with his parents and thus had not yet been emancipated from their tutelage. The permission granted by the father is entered in Polish since he obviously would not have understood Latin. I need help with a baptismal record. I'm trying to identify all the family members mentioned. I believe the infant is Błażej Gnatowski. 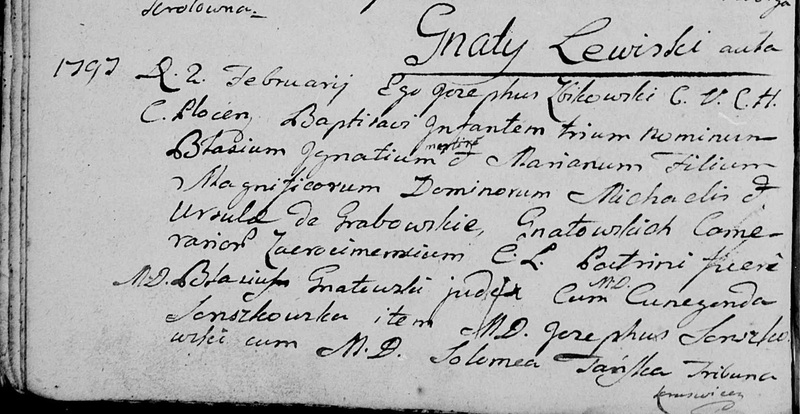 Also, what is the writing/word after Gnaty Lewiski? Godparents were Blazej Gnatowski, Kunegunda Szenskowska, Jozef Szenskowski and Salomea Tansk. Our Latin expert Dave will surely clarify the MD abbreviations and much more. Here is a translation of the record. The word you asked about is aula, ae, f. hall. Here it is used for the Polish dwór, which in English can be translated as “manor house”. Surnames, of course, are not in Latin and thus they are rendered as I see the handwriting. 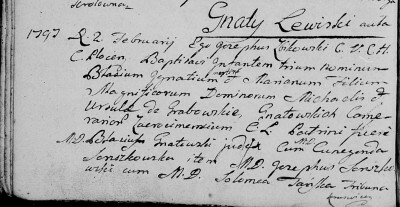 1797 On the 2nd day of February I, Józef Zbikowski, C.V.C.H. * superior at Płock, baptized an infant of three names, Błażej Ignacy Marian (Engl. Marion), the son of the legitimate marriage of the honorable** pan Michał and pani Urszula nee Grabowska Gnatowski,chamberlain at ???***. The sponsors were the honorable** pan Błażej Gnatowski, a judge, with the honorable** pani Kunegunda S?nszkowska and also the honorable** pan Józef S?nszkowski with the honorable** pani (or panna) Salomea Jańska, seneschal of ??? Notes:*The initials stand for the religious order to which he belonged. They are not found in the list of major R.C. religious orders. **Magnificus/a Dominus/a/honorable. The titles “pan, pani, panna”, are the Polish equivalents of the Latin titles. Magnificus/a in Polish is wielmożny/a and classifies the individuals as court officials. ***at ??? I’m unable to determine the geographical location. General Note: Titles such as Camerarius and Tribuna admit of multiple meanings. I picked the meanings which I found appropriate. Feel free to choose another meaning you may find appropriate. So I did find this from 1780 from the Varniai Parish any help on deciphering it? Nobilus Dominicus Borowski argicola ??? filius Vincentii et Elisabethae Bilinski natus in Waysylkow ??? 63 et habitans. Maria Łukawieka filia ? Josephi et Annae ? nata et habitans ? 58. Here is a translation of the entry. Since I’m not familiar with the area of Lithuania where Varniai is located I’m not able to determine the geographical place names as they existed during the final years of the Polish-Lithuanian Commonwealth (Rzeczpostpolita Obojga Narodów). Given names are translated into their Polish form. In the year and day as above I, the same (as above), baptized an female infant by the name of Urszula, the daughter of the legitimate marital bed ofthe father Kazimierz Małachowski and of the mother Marcjanna Duszeykowna(?) from (unknown [to me] place name). Those lifting her up* were Kacper Małachowski with Katarzyna Giedwiłłowna, all from (unknown [to me] place name). You did a rather good job transcribing the marriage record. Here is a transcription with needed modifications and additions and a translation of the entry. Several surnames are not legible for me due to the faintness of the image of the record. Transcription: Nobilis* Dominicus Borowski agricola miles dismissus reservistae e 15a Legione pedestrium filius Vincintii et Elisabethae Belinska natus in (illegible place name) et sub Nro domus 63 et habitans. 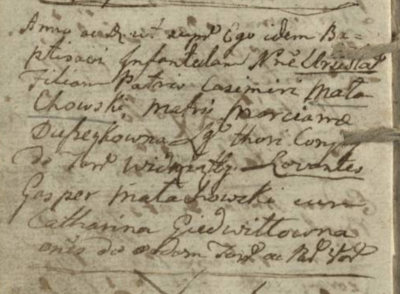 Translation: The Noble Dominik Borowski, a farmer, a reserve soldier discharged from the 15th Infantry Legion, the son of Wincenty and of Elżbieta (nee) Belinska born and residing in (illegible place name) in house number 63. Transcription: Maria Lukawiecka filia pd. Josephi et Annae (illegible surname) nata et habitans sub Nro 58. Translation: Marya Likawiecka, the daughter of the late Józef and Anna (illegible surname), born and residing in house number 58. The given names of the witnesses are Józef and Antoni. The surnames are not legible to me. Both are farmers from the village where the bride and groom were born and lived. (I’m sure that you know the name of the village which is probably the same as the name of the parish.) The bride and the groom had not been previously married. The groom was 28 and the bride was 22. The notation is just the usual legal housekeeping regarding the banns and stating that no impediment had been discovered, followed by the name of the priest who blessed the marriage. Note: *Nobilis/Noble: owner or leaseholder of a parcel of land. Thanks for this, Dave. Interesting that the priest including information on the military reserve service. Thanks as well for including the definition of "nobilis", I always assumed it had something to do with the szlachta. 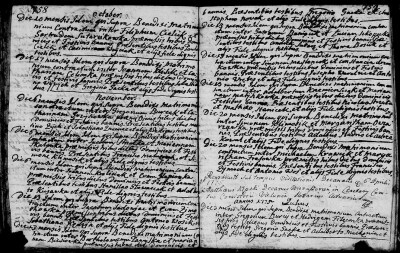 I am wondering if I could get help translating my Great Aunt's birth/baptismal document. Sorry the copy is not that good. 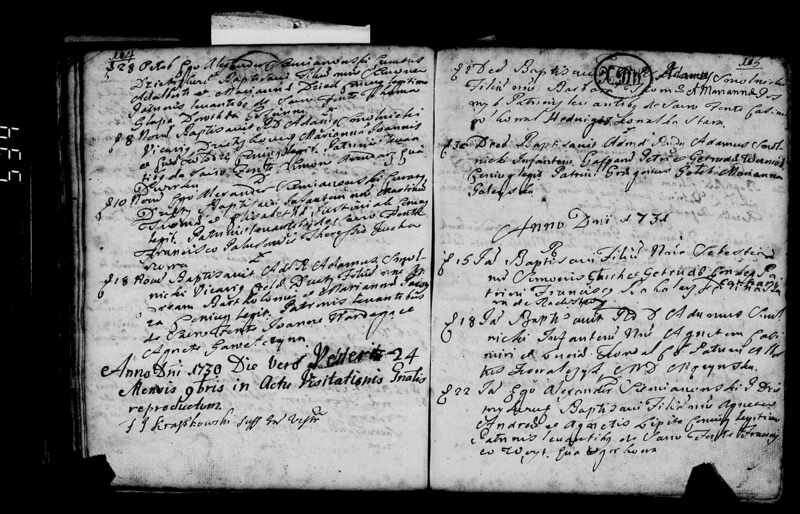 The template I used for the translation may not fit exactly with the headings at the top of the page on which the record is found. There were several minor changes made to the wording over the years. However, it fits the content of the entry. Much of the left side of the document is missing in your post. Hope the translation which follows is of use to you. Col. 8a: PATRIS ac parentum nomen, cognomen et conditio ejus = The name of the father and the first and surname of his parents (i.e. the paternal grandparents of the child) and his condition/status/occupation: Wojciech Plewa, the son of Paweł and of Anna (nee) Chmura, farmers. Notation in cols. 8-9a: Stanisław Sw????? ?, the curate, baptized her. 9b: Condition/Occupation/ Status: farmer; farmer. 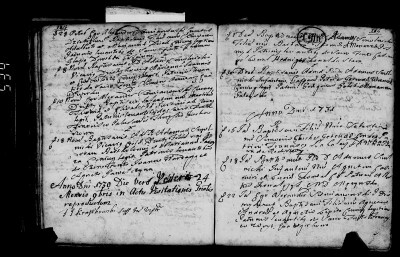 Hello, I would appreciate a translation of the marriage document of my 3xgreat grandfather. The entry on the left side, very bottom I believe to be his. Thank you in advance. Here is the translation of the marriage record. I’m not certain of the surnames but that is how I read the handwriting. On the 13th day of the month (of November) after the banns had been announced on three Sundays, I, the same as above, blessed the marriage contracted between Bartłomiej Pawyska and Maryanna Biesiowka in the presence of the witnesses Grzegorz Gaska and Kristof/Krzysztof Nowak and other trustworthy witnesses. Hello Dave, I have found another document which I believe to show the birth of a child born to Bartlomiej Pawyza and Marianna Bies. It is the fourth entry on the left side. Could you please complete the translation for me. Thank you again for all you great work.